The illustration above left shows the main part to a paper airplane. 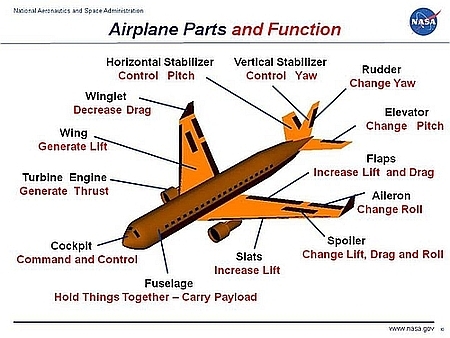 You can compare this to the NASA diagram of airplane parts shown above right. Many of these parts match a real plane in both name and function. But, there are a few very important differences between paper airplane and real planes. Just the nature of thin paper is going to limit how our wings will compare to those of a real aircraft. Most paper airplanes have wings that are short (measured from body to tip) but wide (measured from leading edge to trailing edge). In fact, the width runs all the way back to the back edge of what would be the tail of a real aircraft. There was a time several years ago when it was popular to use scissors to cut away some of the wing to make the paper plane look more real. However, leaving the full uncut sheet produces stronger wings. Just because you don't see a horizontal stabilizer like on a real plane does not mean the paper airplane doesn't have one. It just becomes the back portion of the wing that is doing this function. Also, there is a big difference between the vertical "tail" of a paper airplane and the vertical stabilizer of full size plane. In a real plane this is used to control the left to right movement (Yaw) of the airplane nose. In a paper airplane the flat fuselage and exaggerated fins do this. In a paper airplane the primary need for this "tail" is to act like a wedge to generate a nose up force to balance the difference between the center of gravity of the plane and the center of lift. In a real plane this balance is accomplished by a negative lift produced by the horizontal stabilizer. The back portion of a paper airplane wing tries to do the same thing but is not always enough, so an extra wedge is required for some paper planes. The fins on a paper aircraft are much more essential then on a real plane. Higher pressure air on the bottom of the wing can attempt to "roll" from the bottom to the top (lower pressure) portion of the wing along the sides of the wing. 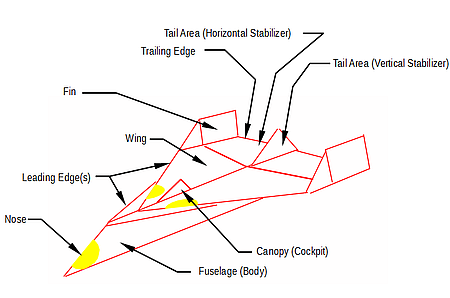 This results in a loss of lift near the outer edge of the wing. When the wings are as short as they are in a paper airplane this can cause total failure of flight. Often this occurs on one wing prior to the other resulting in an uncontrolled spin. On a full size aircraft, or even a slightly bigger model, this results in a vortex (spinning air like a tornado) that trails behind the outer edge of the wing and does not cause total loss of lift. But it does take energy away from the aircraft resulting in increased drag. A real plane usually has something similar to a paper aircraft's fins that are referred to as winglets. These prevent the vortexes from forming and thus help reduce drag. If you are interested a more detailed explanation of any of these functions check out the info available in the The Science of Paper Airplanes in the eBooks section.